Summer drinks make the hot summer tolerable. These healthy drinks quench your thirst and provide you the necessary nutrition too. Summer is the time when you don't want to eat heavy meals or snacks. The hot weather takes your appetite away. Light but nutritious meals are in demand. Cool summer drinks help you keep filled and satisfied without feeling heavy. 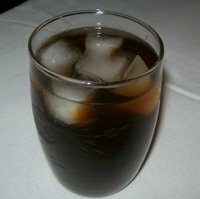 Most of these drinks are easy to prepare and do not take a long time to make. You can use the summer fruits and vegetables to make the summer drinks such as smoothies, milkshakes, vegetable juices etc. Just make sure not to add too much sugar in it. You may use natural sweeteners such as honey. - cool and refreshing on hot summer days. - made with mango, an Indian summer fruit and yogurt as a snack or for breakfast. When mangoes are not in season, this can be made with mango pulp, store bought or home preserved. - Aam Panha, Raw green mango drink for hot summers. Summer is the season for mangoes. 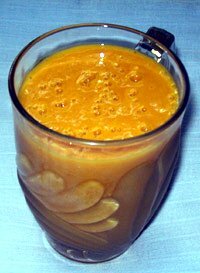 Salty Lassi - Cool Low fat drink Recipe. 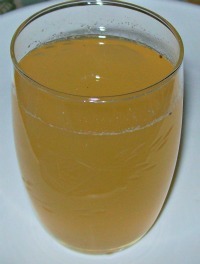 A buttermilk drink. Banana lassi - Simple banana and yogurt drink. Tomato Juice Recipe - How to make tomato juice. Tomatoes are available through out the year. Make this juice for breakfast or during the day time as a cool drink. Badam Milk - Almond Milk - Badam milk is nutritious. It can be had hot or cold.